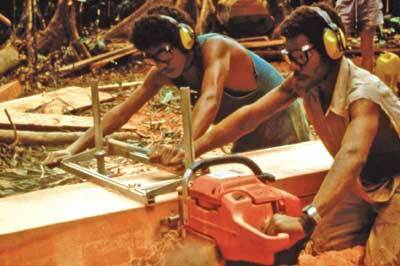 Traditionally, all trees were cut with axes and hand saws prior to the introduction of the chainsaw. Chainsaws are noisy, polluting and very destructive in the wrong hands; but used with discretion, they are a highly developed piece of technology. I cut short rotation coppice with a billhook, up to about 5cm with a bow saw and beyond that with a chainsaw, but I do prefer cutting the shorter rotation by hand. Most modern chainsaws have catalytic converters and use biodegradable vegetable-based chain oil, and a two-stroke synthetic low-smoke oil. A two-person crosscut saw is the alternative to a chainsaw for larger timber and if kept well doctored will keep two people very fit! Bow saws are ideal for 5cm coppice and the 53cm triangular shape is the most useful to get in amongst the rods. The billhook is the perfect tool for cutting short rotation coppice or in cycle hazel. One of the dilemmas in forestry practice is the extraction of timber, as taking large logs out of the woodland causes a lot of damage. Large machinery is needed and the woodland rides get compacted. One answer to this on sensitive sites is to bring the mill to the log. There is now a wide range of portable sawmills available, and many operators will hire themselves and their sawmill on a daily basis. The most basic mill is a chainsaw mill, a one- or two-person operated chainsaw and frame that can be carried to the most awkward of places. The mill works with a rip chain and is therefore quite wasteful unless you have a good market for sawdust, but it is very cheap compared with other alternatives. For a high-quality finish, the mill needs a bandsaw blade. 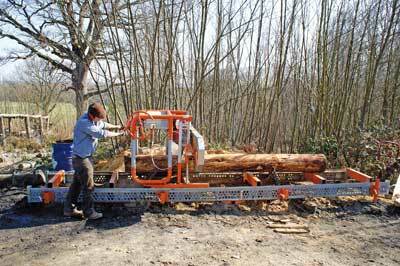 Mobile bandsaws such as the Wood-Mizer and the LumberMate are easily towed with a four-wheel drive vehicle to be set up in a woodland and they produce an excellent finish. Another option is the Lucas Mill or Forester Swivel Saw, which are plate blade sawmills that can fit into an average pickup, be set up by one person and produce a good-quality finish. These mills could be a worthwhile investment for adding value to woodland. Large harvesters are hard on the environment. Some smaller machines are one-person operated and drive on caterpillar tracks, which are less damaging than most. The most appropriate form of extraction is without doubt, however, still the horse, in a process known as snigging. Using horses also supports the continuation of the breeding of Britain's working horses. 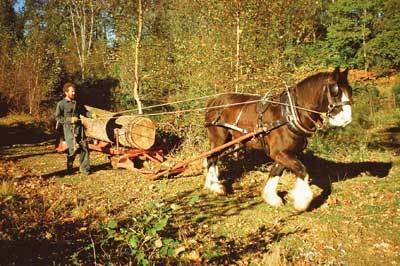 In my own woods, I use a number of different methods of extraction, from carrying out timber 'on the shoulder', tractor and forestry winch, Alpine tractor with trailer and horse. Every wood is different and extraction methods will vary depending on sensitivity of the site, slope and availability of equipment. When a living tree is felled, the wood is at that stage known as green wood. From that point onwards the wood begins to season. Different species have different moisture contents and the wood shrinks as it dries out. When wood is worked and shaped while it is still green, it still shrinks and distorts as it dries, but it is less likely to split than wood that has been cut into planks using a sawmill. Our education makes us think of starting with a plank, cutting the plank to size and then shaping it to make the end result. When we use green wood, we can start with a tree or branch and the wood will be softer to work with hand tools, and will cleave and bend more easily than seasoned wood. The result is a far stronger piece of wood than one which has been sawn as the fibres have not been cut. Seasoning or drying wood removes water, reducing the moisture content. 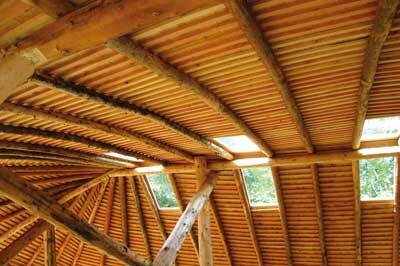 The wood shrinks during this drying process, the weight of the wood is reduced and its strength is increased. Seasoning wood often involves air drying. Where wood has been converted into planks it must be stacked carefully on firm, level ground. A solid base or large bearers are needed. 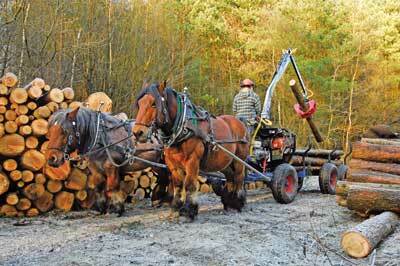 Bearers should be placed at a specific distance depending on the thickness and species of wood being stacked. The sticks used to separate the planks should be placed directly above the bearers. The stack of planks should have air circulating above, under and through the stack and it should be protected from rain. Wood carefully stacked will air dry satisfactorily over a period of time - depending on the size of planks, species, etc. Air-dried timber will hold some moisture content and whether air drying is enough or kiln drying is needed will depend on the end use of the timber. The expensive option is kiln drying, which involves placing timber in a container where the air supply and air-flow direction is controlled by fans, dehumidifiers and, of course, heat. The advantages of kiln drying are the control of the moisture content of the wood and speed of drying - it takes days as opposed to months or years. If you are preparing wood to sell for building construction, then kiln drying will usually be necessary for timber that is going to be used for floors, doors, stairs and window frames. The majority of the coppice I work is sweet chestnut (Castanea saliva). Most coppice workers look at sweet chestnut as potential fencing posts or split palings on a 12 to 15 year cycle and split rails on a longer cycle. When looking at a stand of chestnut, they are looking for quality straight poles that will cleave easily and of course for stocking rates. When I look at a stand of chestnut coppice, I see straight poles but I also look for natural curves and arches. If I cut a stand of 12-year-old chestnut, the longest and straightest poles will go for rustic building or pergola construction. These are specific markets and usually I am also commissioned to erect the project, so I get a labour wage on top of the price of the wood. Arches are stacked in separate piles and are made into rose arches or rustic furniture. Curves are used for rustic furniture or for the sides of raised vegetable beds. Forks of all sizes are saved and used in garden seats or children's chairs, or long ones for clothes props. Some large poles are cleaved and steam-bent into the hoops for yurts and I look for walking sticks amongst the lop and top. Nuts are harvested and sold from standard chestnut trees, saps are tapped from many birches and maples growing amongst the coppice and I am looking at a medicinal market for barks and other by-products. By making a diverse range of products and establishing good local markets, I can return at least three times the value of one acre of chestnut cut just for fencing posts or palings. 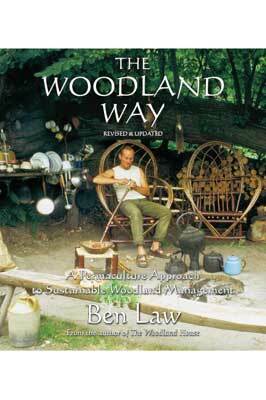 By adding value wherever possible rather than just selling the raw materials, it is feasible to earn a living from a far smaller area of woodland than is usually considered viable. When I first started selling charcoal, I spent two days a week during March visiting shops and garden centres with my product. Looking back, it was time well spent. Having established a good customer base for one product, it is then easy to offer other products as they come on stream. Craft fairs and farmers' markets are good places to sell value-added products as you are selling direct to the customer and getting the full retail price for your product. If you plan to sell packaged products like charcoal, then investing in a well-designed logo will help sell your products, both direct to customers and to the retailers. The internet has also opened up huge marketing opportunities. However you decide to sell wood or products, don't underestimate the time you need to put into marketing. If you work woods in one particular area and focus, as I do, on the local nature of your product, you will quickly build up a local market that will grow year by year. 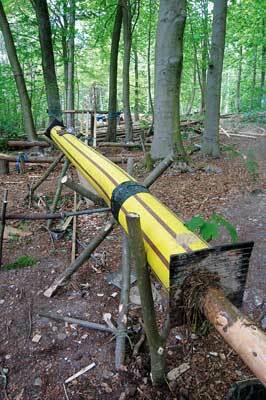 Craftwork is a traditional way to add value to woodland timber, in particular coppice underwood. Summer is the time of craft fairs and the opportunity to sell your crafts at a retail price, get new ideas and learn from other craft workers. Winter evenings and spring are therefore the time to make your crafts and to get products ready for the fairs. 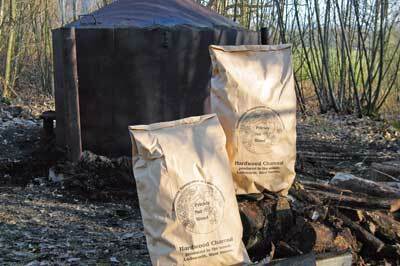 I make charcoal as it utilises poor quality timber and is easy to sell. There is a growing market and it makes good use of all the wood that has not been used for other products, as well as offering an alternative to the large amounts of imported charcoal often coming from the Indonesian rainforests or mangrove swamps. Charcoal also makes use of overstood coppice material, in particular overstood hazel whose market when large and curved needs some imagination! 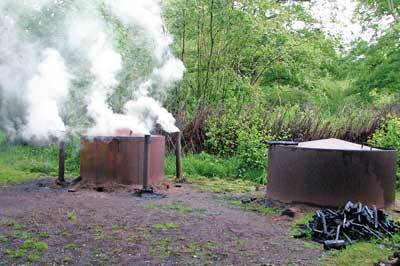 Barbecue charcoal is the primary market, but artist's charcoal made from willow (Salix spp. ), spindle or occasionally oak (Quercus robur) is a useful high-value product. Charcoal dust is used as a soil sweetener by horticulturists and in industry for filtration purposes. Biochar, the use of charcoal as an addition to the soil, is a growing market and a helpful addition to sell the large quantity of 'fines' - small size charcoal - that builds up in the wood when burning regularly. For a substance used primarily for its value as heat, charcoal can also be used for cooling. I use a charcoal fridge, which is a box surrounded by charcoal that I water at least twice a day during summer. The hotter the day the quicker the water evaporates, cooling the fridge box. The pole lathe is once again becoming a more common sight with woodworkers who need to turn wood for a craft project. The quiet rhythm of the lathe is the perfect tool, easy to make and therapeutic to use. Along with the shaving horse, it forms the backbone of the woodland workshop. Steam-bending wood is a useful technique to create curves, hoops or any particular shape you require. The process involves ensuring that the wood absorbs the right amount of steam so that it can be bent to shape around a jig. When steamed to the correct absorption level, the wood should bend without splitting and is then set to cool in the jig. The bending process readjusts the fibres, which then reset in the new position. If you steam green wood, the process conditions the wood in a similar way to seasoning. I use the term 'weaving' loosely to cover all craft products that involve the weaving of wood. 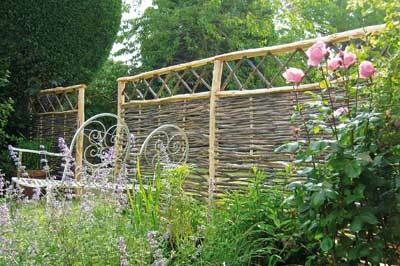 This includes the many uses of willow, from basketry to woven panels and living willow structures; hazel and its use in hurdles and woven furniture; oak for swill baskets and lime (Tilia vulgaris) or wych elm (Ulmus glabra) for the use of its inner bark - bast - for seat weaving, to name but a few. Joinery includes rustic furniture, gate hurdles, Windsor chairs and just about anything else you can think of where pieces of wood are joined together. Always remember that green wood will shrink, so allow it to season in its finished state before constructing or, if mixing green and seasoned wood, use green for the mortised wood and seasoned for the tenon. With a slightly loose fit the green wood should shrink tight onto the tenon. Joinery is possibly the most effective way of adding value, but it can also be one of the most time consuming. All of these craft categories should be symbiotic. For example, the bodged legs are jointed into the chair with a steam-bent back and a woven seat and the offcuts are converted to charcoal. 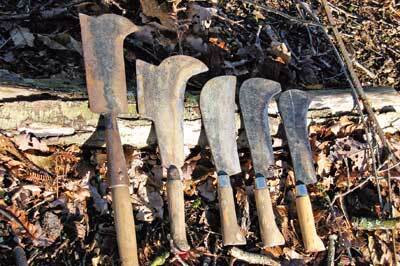 A range of craft skills will ensure that you can gain the highest possible value from a small area of woodland. With high forest timber the knowledge of value will be the key in deciding what to do with any particular tree. Large timber is heavy and awkward to extract from the woodland and costly to transport to the sawmill, so on-site conversion should be the first option considered. But conversion into what? Or does the timber have another use with higher value? Identifying whether a tree is of veneer log quality - logs which are of straight, knot-free quality that are peeled into strips and then used to cover furniture of poorer quality wood - takes a trained eye and it may be a good investment to call in a local timber buyer to have a look. So veneer quality logs and turnery burrs - a rough growth that develops on the side of the stem and can make beautiful bowls - may be your optimum market, and other saw logs should be converted on-site where possible. The majority of our timber - about 85% - is imported, yet around us lie derelict woodlands and unemployed people. It just doesn't add up! Imported timber comes from all over the world and unless the timber you are buying is certified, there is no way of knowing what ecological damage your purchase has done. 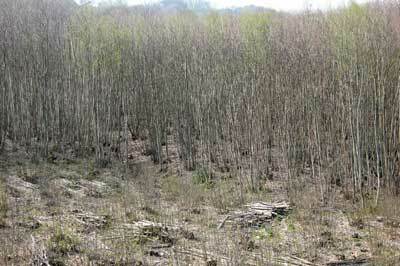 It may be that the timber has been clearfelled from a poorly managed woodland. It may be affecting rare species or causing soil erosion. Socially it could be affecting the lives of indigenous people as your purchase could be stimulating illegal felling within indigenous reserves - common in many parts of the world. And whether it is certified or not, it is still travelling vast distances, using up fossil fuels before it eventually arrives in your locality. As with food, in order to live sustainably and provide for future generations, buy local timber first and encourage local shops to stock local woodland products. 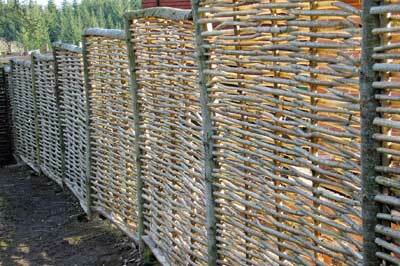 Hazel hurdles are reaching a new peak in popularity as a garden fencing product. These hurdles are made from coppiced hazel in the woodland. Buying them as opposed to a chemically treated softwood panel continues to sustain an ecologically valuable habitat, provides rural employment and puts market pressure on landowners to plant less conifer plantations and more hazel. Beware of cheap, imported hurdles in garden centres. These are generally identifiable by being fixed with nails and made from small diameter non-cleft hazel. 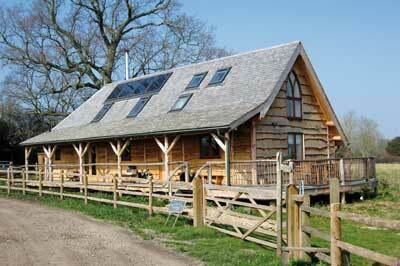 Buildings can be constructed from our own woodlands. A revival in oak timber frame is certainly welcome, however the majority of oak timber framing companies in the UK import their timber from Europe. Alternative timber framing species such as Douglas fir (Pseudotsuga menziesii) and sweet chestnut should be encouraged as should looking at alternative designs for construction, for example, utilising small diameter roundwood and coppice produce in the building industry. The University of Surrey Civil Engineering Department has been involved in a European project looking at roundwood timber for construction. They have carried out strength testing for small diameter timber, structural systems, connections between roundwood and demonstration buildings. Chestnut has received a British Standard within the building industry enabling it to be used more often as it will fit in with Building Regulations criteria. As we start to use more of our local material so our cultural heritage is preserved and revived. The charity Common Ground promotes the importance of our locality in common culture and has pioneered a local distinctiveness project that seeks alternatives for the spread of uniformity throughout Britain. In the future, chestnut buildings are likely to be found predominantly in the southeast of England as this is where the majority of chestnut coppice grows. Meanwhile in northwest Scotland, we can expect to see more like the Planterose's locally grown roundwood column buildings. These could become future distinctions of locality, as flint and local stone have been in the past. Pick up the new issue of Woodworking Crafts today!